"Man's best friend" -- the dog? Not to a member of the Japanese guild of Master-Cormorant-Fisherman, whose ancestors have relied for 1300 years upon feathered assistants to fish for the emperor's imperial dinner table. Young sea birds are captured from ocean cliffs of Ishihama, massaged and hand-fed. For the next fifteen years, the birds will swim underwater, catching more than a pound of fish daily from the Naragra river, often under the admiring gaze of tourists. Each fishermen uses up to a dozen birds with hemp-string tied around their necks to prevent them from swallowing large fish. 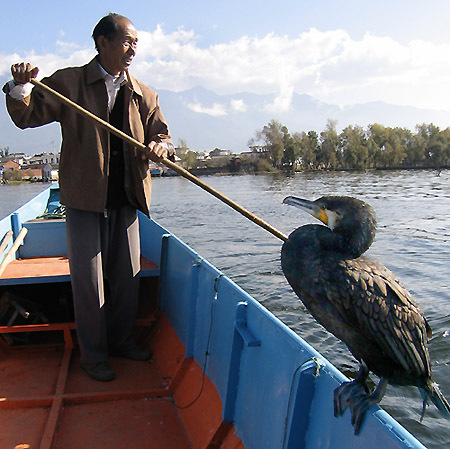 The birds are carefully dragged back to the boat with a thin cord, their catch is regurgitated, and the cormorants are hand-fed scraps of fish small enough for them to swallow, creating a close relationship between bird and man. Iin China, hatchlings are taken from nests and hand-raised in baskets with hot-water bottles, and sold and traded for substantial sums. Ancient effigies have been found among the Incas of South America, and cormorants even fished for King James I of England the year 1610 in a specially constructed lake in Westminster. 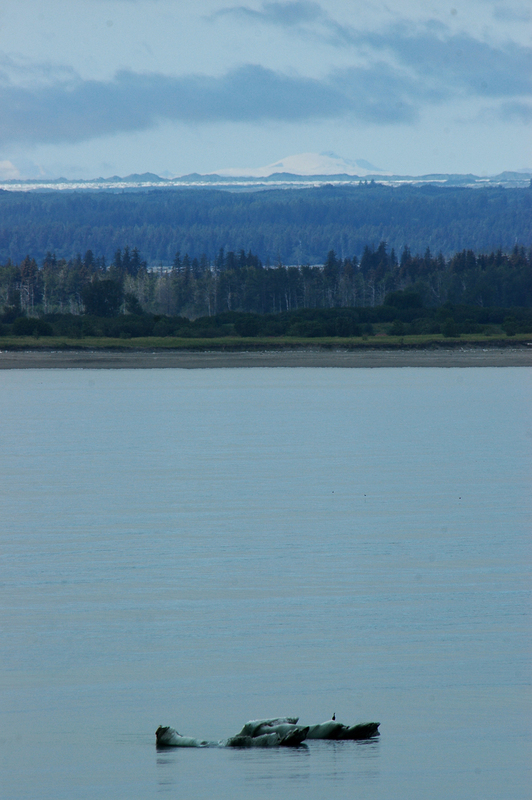 Cormorants that have colonized almost every part of the world -- including the Hubbard Glacier of Alaska, where I recently photographed one sitting on a floating "growler." The key to their adaptable nature might be their intelligence -- as evidenced by their ability to accurately count beyond the number seven. 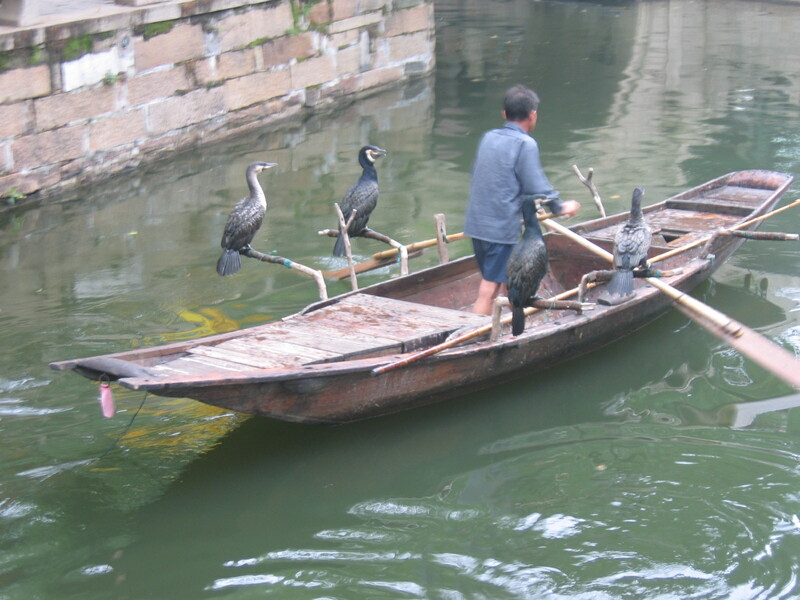 Chinese cormorants on the Li River are allowed to keep every eighth fish they catch. Otherwise they "stubbornly refuse to move again until their neck ring is loosened. They ignore an order to dive and even resist a rough push or a knock, sitting glum and motionless on their perches." That observation was published by Pamala Lady Egremont, dowager of the Barony of Egremont, and the owner of Cockersmouth Castle. Co-author of the paper was Miriam Rothschild, eccentric heiress of the Rothschild fortune, and renowned expert on fleas. Neither has yet responded to my requests for an interview.